A charity founded by an industry entrepreneur is appealing to hospitality operators to get involved in a fun awareness initiative to help drive blood stem cell donor registrations. Unusually for a charity The Team Margot Foundation, co-founded by Yaser Martini, who is a board member of Beds and Bars, PubAid and Cirrus Inns, isn’t asking operators to raise money but instead to support in helping spread the message about blood stem cell donor registration through ‘Pinkspiration Week’ which is taking place from Tuesday, 23rd July to Tuesday, 30th July. This December, the Team Margot Atlantic Rowers, a team of four dads, skippered by Martin Beaumont whose late father Chris was the first CEO of industry charity Springboard, will be rowing across the Atlantic, in a pink boat, in the Talisker Whisky Atlantic Challenge. 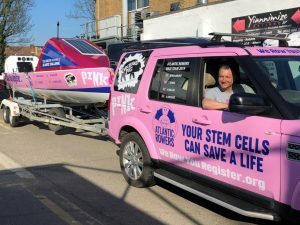 In the meantime, the boat will be doing a road trip around some of the participating ‘Pinkspiration’ venues, as part of the campaign. The rowers hope the ‘Pinkspiration’ campaign will help make a significant contribution towards its ‘We Row You Register’ target of 1.5 million sign-ups to the register, with this number being targeted as it will take them around 1.5 million strokes to complete the challenge. If they succeed in reaching this target then statistically up to 15,000 lives could potentially be saved. Beds and Bars is among operators already set to take part in the awareness week, which is also being supported by UKHospitality, and which asks operators to embrace the Team Margot colour pink in their business for just a day or the full week. Ideas for activity for the week include featuring a pink drinks list, having a ‘Drink Pink Day’, offering pink-inspired dishes or teams wearing pink to help raise awareness and encourage people to join the register. The Team Margot Foundation was set up in 2015 in memory of Yaser’s daughter Margot and to honour her legacy after she lost her battle with blood cancer, aged two. One of the ways Margot might have been saved was through a well-matched stem cell donation from an unrelated donor on a register. OTP recently attended the Love Well workshop hosted by Love Drinks in association with Healthy Hospo. Ontrade Progress takes a detailed look at everything that is needed to run a pub, club or bar successfully including interior design, security, seasonal food and drink trends, technology and training & recruitment. This is all brought together by the latest industry news, big name interviews and round-table events with senior industry professionals. Distributed across the printed, monthly Ontrade Progress Magazine, the Ontrade Progress website and our various digital and social media platforms - Ontrade Progress is the essential community for owners, operators, and licensees in the hospitality sector looking to keep abreast of news and articles to assist in progressing their businesses.